An injury or cut in the eye? 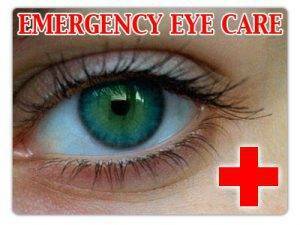 Bay Bloor Optometry offers emergency services that require immediate and urgent eye care. Whenever an injury occurs, one has a tendency to rush to the emergency room. However, when it comes to an eye injury or a corneal abrasion, the best course of action is to seek help from your local eye doctor. Our Yorkville eye doctors understand the make-up of the eye. They can properly diagnose and treat the injury. In fact, Dr. Tepperman is happy to meet over the weekend or do a house call for any ocular emergency. Please call our office at toll-free at 844-404-8042 for further instructions. DO call our office toll free at 844-404-8042 for further instructions! We are here for you! We carry the latest European and American exclusive eyewear collections in a variety of styles, colors and materials.